You will want to print out the following instructions, or book mark them, as they have great reminder details. Then, click on each day for detailed detox instructions per day--through the 5 day Liver Detox. The Liver Detox has the most diet restrictions of all five detoxes, so read carefully for maximum effect. Although a 5-day juice fast is ideal (and what we outline in the above 5-day instructions), it is extremely beneficial to incorporate a 2-day raw food and 3-day juice-fast into a 5-day cleanse. Below is a summary of the 2-day raw food diet and 3-day juice fast. During the morning (after your Morning flush cleansing drink and stopping one hour before lunch), eat all the live FRESH fruit or vegetable juice you want. Beet juice is especially good. Do not mix your fruit and vegetable juices together, and feel free to dilute your juices. For lunch, you can have more diluted juice, or a raw vegetable or sprout salad. Absolutely do not use bottled dressing. Make your own dressing from lemon or apple cider vinegar and any fresh herbs and spices of your choice. If you are hungry throughout the day, feel free to snack on fresh vegetables or juices. For dinner eat fresh fruit or fruit juice or fruit smoothies. To help the detox and ease nausea, consume two cups of the Liver Flush Tea™ after the morning flush and 5-8 cups throughout the day. Fill a large pot with water and add several tablespoons of tea. Let soak overnight. In the morning, simmer for 20 minutes. Sweeten the tea with honey as desired. You will also start taking 4 droppers of each of both the Liver Tincture™ and the Blood Support™ in 1-2 oz of juice. Repeat 3 times a day until bottles are finished (if you miss a dose, keep taking until the bottles are finished). To get past the taste (very bitter, very spicy), mix a thin sweet juice such as apple or pear in a glass with the Liver Tincture, down it in one gulp like a shot of liquor, and then swish some plain juice in your mouth to clear the taste. Thick juices such as peach or orange tend to coat the mouth, which makes the taste linger – not good. And diluting it more simply means you have to drink more, rather than getting it all down in one quick gulp. After your morning flush, drink diluted juices and herbal tea throughout the day -- as much as you can drink. Try to consume 128 oz of liquid during the day. Also recommended throughout the day is consuming several cups of potassium broth. Potassium broth takes advantage of the fact that the outside of a potato is one of the highest plant sources of potassium. Find recipe here. For those who don't want to do the full liver detox, there is a slow and easy version that will give you 70 to 80 percent of the benefit without the difficulty. As part of your daily diet, just eat one cup of raw, freshly grated beets mixed with olive oil and lemon juice for thirty days straight. 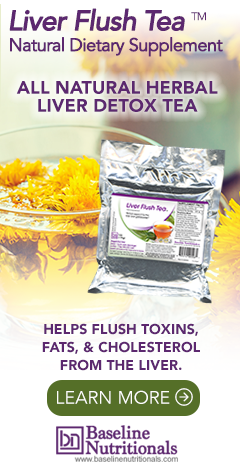 Daily use of a Liver Flush Tea™ is also required, as well as using one bottle of Liver Tincture™.